Can be used for the testing of Telephone wire, Coaxial cable and Twisted pair network cable. Remote unit can be detached for remote testing. More Product Info8 Piece SOHO Network Tester and Tool Kit. 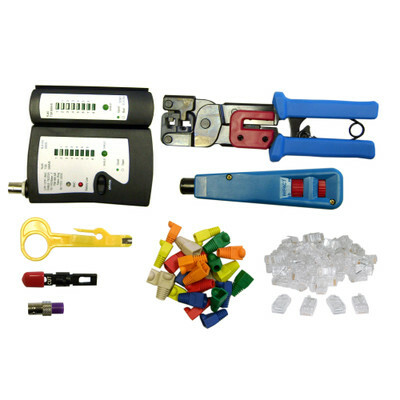 Remote Cable Tester: Universal tester equipped with RJ11, RJ45, BNC. Can be used for the testing of Telephone wire, Coaxial cable, and Twisted pair network cables. Tester LED displays status of Short, Connection, Non-Parallel, Open, Terminator Value, Battery condition. Remote unit can be detached for remote testing. Combo Crimping tool: Cut and trim Cat3 / Cat5 twisted cable. Crimp wire into both RJ45 and RJ11 connector. Impact / Punch Down Tool: 2 impact settings for different wire gauges. Comes with 110 type blades, 66 type blades, and a Stripping Tool. For easy handling of stripping wire. Stylish design. Supplies: 30 pieces of RJ11 connector with 50U gold plating. 30 pieces of RJ45 connector with 50U gold plating. 24 pieces of boot for RJ45, in assorted colors.